Is this the most beautiful spot on earth ? Karakul Lake, China — comes close to being IT. 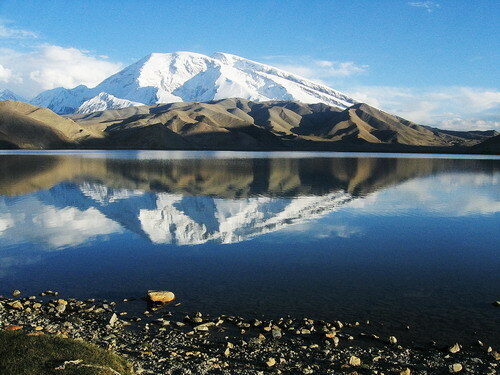 KARAKUL LAKE. It lies between Tashkurgan and Kashgar in West China province of Xinjiang. There are a scattering of Kyrgyz-chinese shepherd families, at the foothills of the Pamir mountain range which separates China from Tajikstan who can offer you accomodation in YURTS. There are three very accessible and beautiful 3,000m high lakes. Cobalt Blue skies, Fresh air, sunshine, friendly people, salted tea, lepeshka bread, snow mountains, steppes, and frolicking with one-of-a-kind bactrians. But be warned: you must play hide and seek with the a corrupt Chinese man.